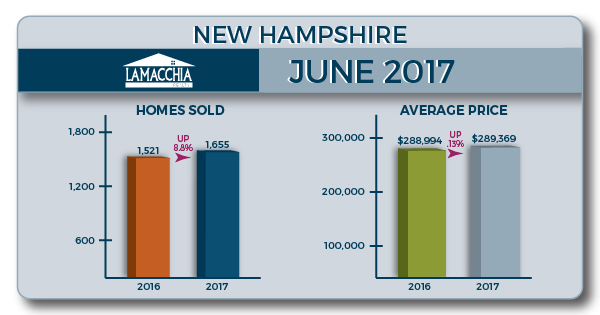 The Lamacchia Housing Report presents overall home sale statistics and highlights the average sale prices for single families, condominiums, and multi-family homes in Massachusetts and Southern New Hampshire for June 2017 compared to June 2016. It also looks at other metrics in Massachusetts like Homes Listed and Pending, as they are often the best indicators for predicting future trends in the market. Massachusetts home sales increased a little over 3% in June 2017 from June 2016, similar to May 2017’s near 4% increase. So far, 2017 has been up and down – January started off the year very strong, then February home sales fell in every category. In March, we were back up, in April we were down, then back up in May. June is the first month to break that pattern and remain up for the second consecutive month. Home sales increased across the board for single families, condos and multi-families this month compared to June 2016 with multi-families increasing the most at over 9% (from 795 sold in June 2016 to 867 in 2017). Single families rose 1.16%, from 7,387 to 7,473 and condos went up a 6.3%, from 2,828 in 2016 to 3,007 this year. The average price increased in every category, with a total increase of 8.9% – rising from $401,160 in June 2016 to $436,904 in June 2017. Multi-families increased the most in price, by 18% from $402,951 to $476,308. Condo and single-family prices rose 10.2% and 4.4% respectively. 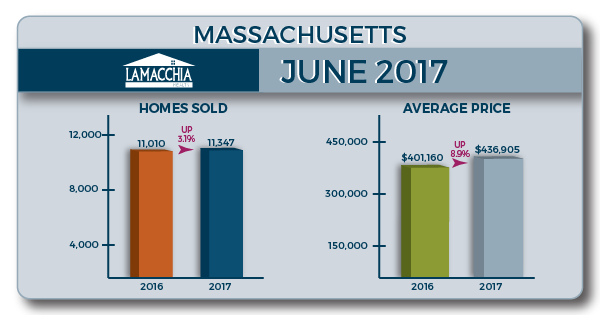 There were 11,375 homes listed for sale in Massachusetts in June 2017 compared to 11,858 in June 2016 which represents a 4% decrease. May showed a 7.24% increase in listed homes, so this month is a negative change which could lead to a drop in home sales in the next months to come. From July 1st to the 15th, the number of homes listed is down 7.6% from last year which shows that the limited inventory, which has been the market’s trend this year, is continuing into the summer. Lower inventories and higher sell prices still indicate a seller’s market. There were 10,719 homes that went pending in June 2017 in MLSPIN compared to 10,751 in June 2016, which represents a very slight decrease of just under half a percent. Although not a statistically significant change, when the number of pending homes is down, it shows that the number of sold homes could be down in the month or so to come. As of July 15th, pending sales were down by 7.7% from last year at the same time. Again, this shows that buyers are now taking their time, as mentioned in Anthony’s most recent Market Report Video (click to watch), but it could also show that with inventory being lower than usual, buyers aren’t finding what they’re looking for at the prices they want. The number of properties sold in Southern New Hampshire rose 8.8%. Multi-families increased by the highest percentage, 39%, but only from 52 in June 2016 to 72 in June 2017. Condos rose 9.1%, from 375 to 409 and single-family sales increased by 7.3% in June, from 1,094 to 1,174. Average price for homes in New Hampshire increased overall by an eighth of a percent (.13%), with single families being the only category that increased by 5% from $301,375 to $316,487 in June 2017. Condos and Multi-families decreased in average price, by 12.85% (from $266,254 to $232,038) and .3% (from $277,747 to $276,959) respectively. With average prices and home sales up in both Massachusetts and Southern New Hampshire, it’s clear that June was a very productive month for sellers. Conversely, Massachusetts homes listed and pending were down from June 2016 which is consistent with this year’s inventory levels being the lowest in 17 years as discussed in our April Housing Report. Sellers, in this situation, have the upper hand. The market usually shifts around summer time so that buyers have more homes to choose from and more leverage with sale prices, but the shift is happening later than usual.